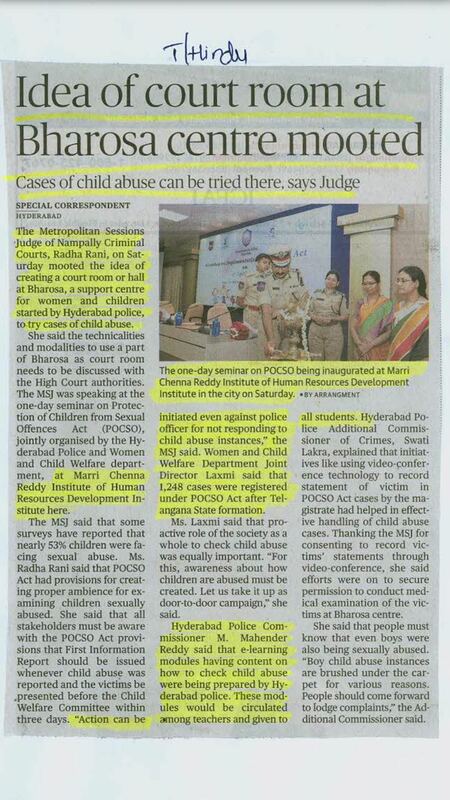 Tharuni, as State level Nodal Agency for Girls Advocacy Alliance Project of Terres des Hommes, Netherlands, organised one day orientation for all the NGOs working for the Girl Children from 31 Districts of Telangana State, to day at BC Bhavan, Himayathnagar, Hyderabad.The aim of the Orientation is to bring all these NGOs to a network to serve the girl child, unitedly. Dr. Mamatha Raghuveer, Founder ,Tharuni, explained in detail the importance of net working of all the NGOs together, on the empowerment of the girl children in the State of Telangana. 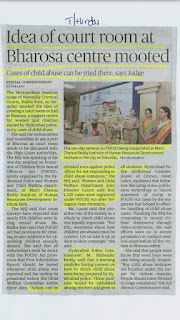 She also stated about the GAA Project and its goals, along with Child related laws, to the representatives of NGOs. Later the Participants also explained the difficulties they face , while implementing the legal enactments.They accepted to work together as a Network to solve many problems they come across, to empower the girl children. 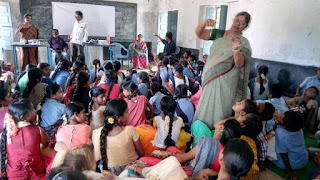 Dr.chitra bhanu of 'manruham science activities center',Hyderabad demonstrated different science activities to the students of warangal villages,to motivate them on the importance of science in day to day life. Hexagon representative koppaka Bhaskar ,Tharuni team members participated in the event. Tharuni, under Girls Advocacy Alliance Project of Terres des Hommes, Netherlands conducted two day District Orientation Programme for NGOs on 30th and 31st March 2017 at Warangal. The workshop was participated by 20 Non Governmental Organisations Representatives in the District. The venue was Mallikamba Mano Vikasa Kendram, Balasamudram. 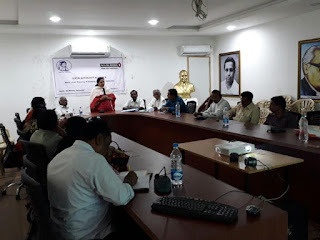 Dr. Mamatha Raghuveer Founder, Tharuni reiterated the importance to make the District without any Child Marriage.She explained in detail the child related enactments to protect the Children . 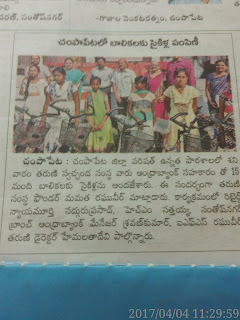 Tharuni distributed 15 Cycles to the girl students under Cykul to School Project of 'Tharuni Swecha', on 3rd April 2017 at Zilla Parishad High School , Champapet, Hyderabad. Andhra Bank ,Zonal Office, Hyderabad which was kind enough to donate Rs. 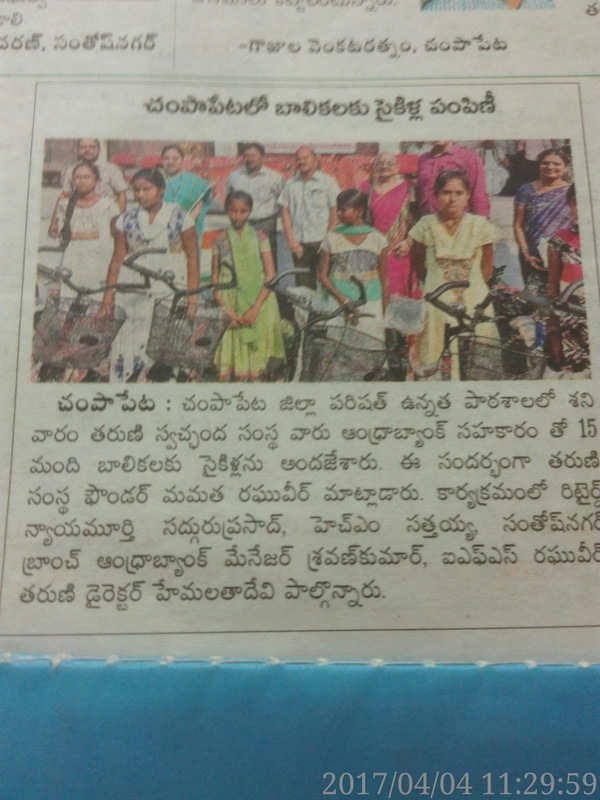 50,000/- along with other donors, under corporate Social responsibility.Twelve cycles were given to Warangal Rural Girls and three cycles were given to the students of ZPHS, Champapet. Dr. Mamatha Raghuveer, Founder, Tharuni thanked the Donors , particularly,DGM Sridhar of Andhra Bank for helping Tharuni to continue this project, initiated by her and Latajain ,Senior Journalist. Tharuni hopes to donate at least 500 cycles to empower and educate the Girl Children she said. Sri Sattayya, Head Master, ZPHS, thanked the Bank Manager Sri Sravan Kumar of Santhoshnagar Branch and Tharuni for this gesture. He requested a RO Water Plant to the School. Dr. Hemalatha Devi, Director ,Tharuni, Director Forest Academy, Sri Raghuveer, IFS, Sri Sadguru Prasad District & Sessions Judge (Retd), also shared their views about the importance of the Project. Students thanked the Andhra Bank. Refreshments were given to the School Children.